Van Voorst Concrete, Inc. is a faith based, family owned and operated, 3 generation concrete construction business. We have set the standard in the tri-state area for over 56 years. We specialize in all types of concrete construction. This includes commercial and residential foundations walls, commercial, residential and agricultural flatwork, street and road projects, hog confinements, cattle confinements as well as many different decorative concrete applications. With vast experience and a 120 mile radius from Hull, Iowa— covering a lot of ground, we provide quality products and services to Siouxland. We pride ourselves in giving our customers service that is on schedule with high quality work and assurance that we will stand behind our services. In 1962, Clarence made a decision to start his own construction company. He started with nothing more than a bag of mason tools. He first started by shingling the country school house near Boyden, laid the masonry for a production plant in Orange City, and began a journey of living out a dream of working for himself. Clarence was inspired by people he worked for, and blessed with a DNA of working hard to accomplish his goals. One scoop of cement powder, three scoops of gravel, and one wheelbarrow at a time, he began to pave his future in the concrete construction industry. The location of business has changed throughout the years. It started in Boyden, then moved to a farm west of Hull, and finally put it roots down at its current location since 1990, at 607 Black Forest Road in Hull, Iowa. 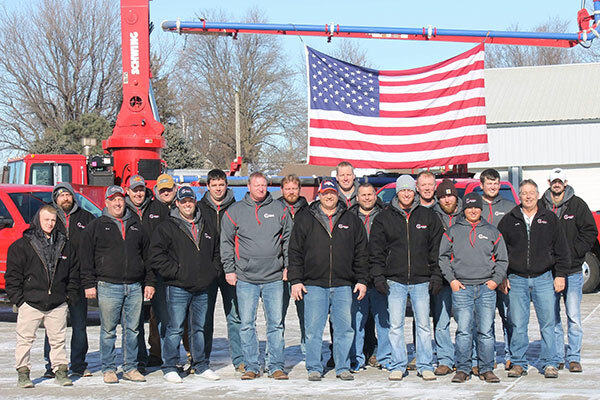 The face of Van Voorst Concrete has remained the same throughout the years of moving to different locations. With many humbling beginnings, a determined spirit, and an unwillingness to settle for anything but the highest quality service, Clarence worked to build a concrete company that today sets standards in quality, craftsmanship, and service. To say concrete runs in the family blood would be an understatement. In the early years, Clarence had 4 of his brothers working for him, all of which later developed their own concrete companies in the area. With many nephews of his brothers now working in the industry in those companies, and Clarence having two sons and five grandchildren working for him, the Van Voorst name has become synonymous with the word “concrete”. In his 56 years, Clarence’s work covers the 4-state area with few miles in-between that you don’t see a project influenced by Clarence or one of the many employees that have come and gone throughout the years. With the grace of God, and an unmatched determination to persevere through many ups and downs of business, he built a company that today shares ownership with his 2 sons, Marlin and Mark, employs 5 of his grandchildren, a workforce of approximately 30 full-time employees, and 10-20 part-time employees. Van Voorst Concrete, Inc. has developed into a full service concrete construction company marked with the consistent service, high quality craftsmanship, and Clarence’s unbeatable work ethic. Van Voorst Concrete, Inc. offers services for any type of Agriculture, Commercial, Residential, Street Paving, and Decorative. His company also offers a concrete pumping service, MCM Pumping. With the next generations already involved in the business, Van Voorst Concrete, Inc. is looking forward to paving the future with the same characteristics that Clarence has “set the standards” in the industry for the past 56 years.